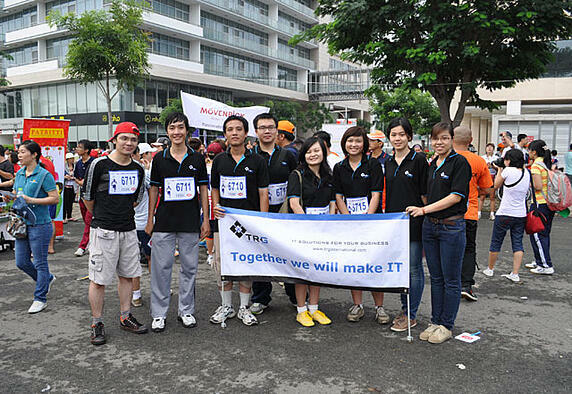 HCM City, 2 Oct 2012 - Twenty-two participants from TRG International joined thousands of other runners in the BBGV Fun Run on 30 Sep, 2012. In the early morning of Sunday, the Crescent area in Phu My Hung, District 7 was already bustling with men, women and children doing warm-ups to the music. The first 500 runners to reach the finish line also received a prize from the sponsor. The event was regarded as a great success, raising a total of $40,000 for charities in Vietnam. Viet Vang, junior graphic designer at TRG International, was excited to join the Fun Run for the first time: "This was an excellent opportunity not only to get some morning exercise but also to contribute to the community. The Fun Run was really fun and I had a great time". TRG International is an independent provider of IT business solutions and supports thousands of users in nearly 70 countries. Clients range from small domestic companies to very large global multinationals in both the public and private sectors.